Finally it feels like fall here in Virginia! The wardrobes have been flipped, there is a definite bite in the morning air, and we moved the thermostat to heat over the weekend (if only for a few hours). 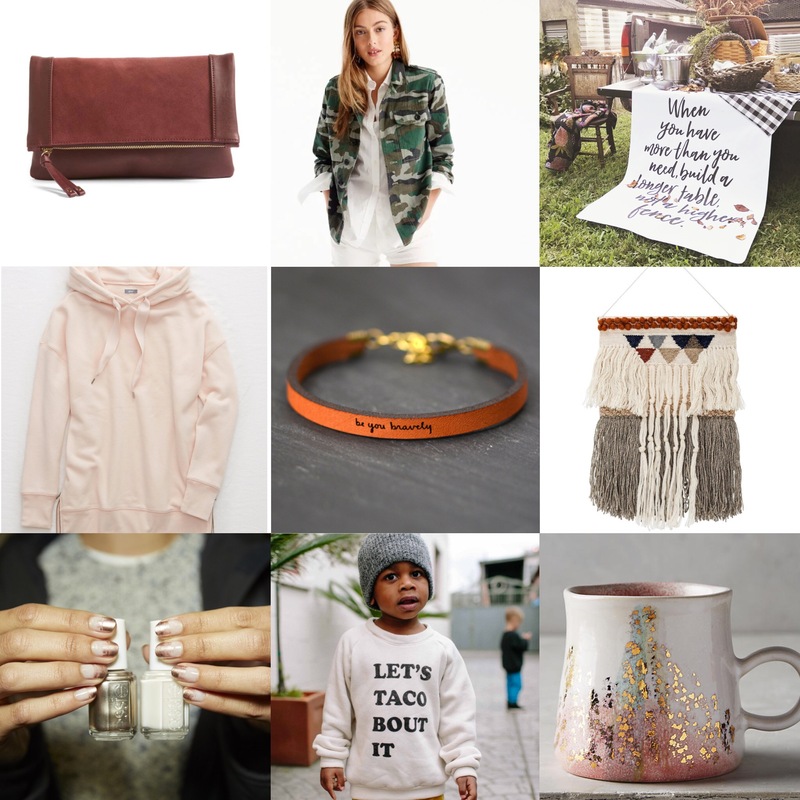 I’m not thinking Christmas gifting just yet—though my children are already modifying the lists they made THIS SUMMER—but these seasonal finds give me all the feels. Listings go left to right, top to bottom. I like my handbags big and as a mom of four, you never know what you might find in my purse. But after my sister-in-law gave me a clutch for my birthday, I’ve been drawn to this handy style. I love the color and the price of this foldover clutch from Sole Society. Not only is Army green a hot color for fall, but camo is officially fashion, a statement that gives my veteran husband a chuckle. I like this JCrew camoflauge shirt-jacket and would pair it with jeans and a sparkly shoe. I have followed House of Belonging for a while on Instagram and love them for their wooden signs, their baby swaddles, and their paper placemats. Now, the 3×4 paper banner has caught my eye, and I’m thinking it would look just about perfect on my farm table this fall. This AEO fleece hoodie with ribbon drawstrings and side zips has me swooning. It seems ideal for a day in leggings and wooly socks. At $35 and in four yummy colors (think burnt orange), it may not last long. In 2005, local Charlottesville artisan Laurel Denise turned a gift of dainty handwriting into a business. Her leather bracelets, metal cuffs and necklaces are now sold in boutiques in over 30 states and Canada, and her one-of-a-kind custom pieces can be ordered online. I love the idea of throwing on a thin leather band to warm things up a bit for fall. And just in case you’re going—I’ll try not to be jealous—Laurel Denise will be a vendor at the Silobration at Magnolia Market in Waco, Texas this October 12–14. I finally snagged a tapestry a few weeks ago at a local market. Woven wall hangings are EVERYWHERE right now, but this wool tapestry from Wayfair has the makings of a beautiful addition to your home. Guess it’s true that trends come back around—I have a distinct memory of a macramé tapestry hanging in our house growing up. Not only are this fall’s nail polish colors perfection, now there are styling techniques that add a little spice to your autumnal nails. I’m a sucker for Essie’s Penny Talk and feel like I could trust my artsy 10-year-old with the design work. Food is the way to my son’s heart, and that combined with the fact that it’s National Taco Day makes this sweatshirt a winner in my book. The LA-based company Kira Kids has the market on cuteness, and actually has a page on their website called Tacolicious. Clearly, my Henry approves. I bought my first stoneware mug on vacation a few years ago and, I’m telling you, it is an absolute go-to for my morning joe. The heaviness of the stone and smoothness of the enamel feels just right. This handpainted stoneware mug from Anthropolgie is gorgeous, and promises to be your new fave.